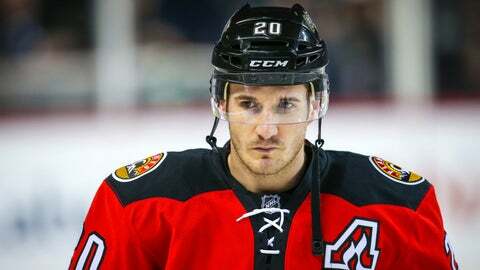 Former Calgary Flames forward Curtis Glencross is ready to focus on his family as he eases into retirement. Curtis Glencross has decided to call it a career. The former Calgary Flames forward announced his retirement from the NHL on Tuesday, according to TSN's Darren Dreger. The 32-year-old Glencross accepted tryouts with both the Toronto Maple Leafs and Colorado Avalanche during the preseason before being released by both clubs. “We have weighed our options and with the young family I'm enjoying a lot of firsts with them,” said Glencross, who has two daughters and an infant son. Glencross enjoyed his best season with Calgary in 2011-12, recording career highs in goals (26) and points (48). The Saskatchewan native collected 134 goals and 141 assists in 507 career games with the Anaheim Ducks, Columbus Blue Jackets, Edmonton Oilers, Washington Capitals and Flames. Glencross has 2 daughters and an infant son and doesn't see either the KHL or Europe as a viable option.